PUBLISHERS: Julia Beverly (JB) Chino EDITOR-IN-CHIEF: Julia Beverly (JB) MUSIC REVIEWS: ADG, Wally Sparks CONTRIBUTORS: Bogan, Cynthia Coutard, Dain Burroughs, Darnella Dunham, Felisha Foxx, Felita Knight, Iisha Hillmon, Jaro Vacek, Jessica Koslow, J Lash, Katerina Perez, Keith Kennedy, K.G. Mosley, King Yella, Lisa Coleman, Malik “Copafeel” Abdul, Marcus DeWayne, Matt Sonzala, Maurice G. Garland, Natalia Gomez, Ray Tamarra, Rayfield Warren, Rohit Loomba, Spiff, Swift SALES CONSULTANT: Che’ Johnson (Gotta Boogie) LEGAL AFFAIRS: Kyle P. King, P.A. (King Law Firm) STREET REPS: Al-My-T, B-Lord, Bill Rickett, Black, Bull, Cedric Walker, Chill, Chilly C, Controller, Dap, Delight, Dereck Washington, Derek Jurand, Dwayne Barnum, Dr. Doom, Ed the World Famous, Episode, General, H-Vidal, Hollywood, Jammin’ Jay, Janky, Jason Brown, Joe Anthony, Judah, Kamikaze, Klarc Shepard, Kydd Joe, Lex, Lump, Marco Mall, Miguel, Mr. Lee, Music & More, Nick@Nite, Pat Pat, PhattLipp, Pimp G, Quest, Red Dawn, Rippy, Rob-Lo, Statik, TJ’s DJ’s, Trina Edwards, Victor Walker, Voodoo, Wild Bill ADMINISTRATIVE: Melinda Pos, Nikki Kancey WEBMASTER: Noel Malcolm CIRCULATION: Mercedes (Strictly Streets) Buggah D. Govanah (On Point) Big Teach (Big Mouth) Efren Mauricio (Direct Promo) To subscribe, send check or money order for $11 to: Main office: 1516 E. Colonial Dr. Suite 205 Orlando, FL 32803 Phone: 407-447-6063 Fax: 407-447-6064 Web: www.ozonemag.com Miami office: 555 NE 15th St. Suite 7731 Miami, FL 33132 Cover credits: Pitbull photo by Julia Beverly; Out Da Cutt photo by Eric Johnson; Uncle Luke photo by Julia Beverly. 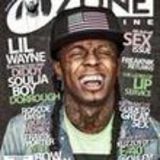 OZONE Magazine is published eleven times annually by OZONE Magazine, Inc. OZONE does not take responsibility for unsolicited materials, misinformation, typographical errors, or misprints. The views contained herein do not necessarily reflect those of the publisher or its advertisers. Ads appearing in this magazine are not an endorsement or validation by OZONE Magazine for products or services offered. All photos and illustrations are copyrighted by their respective artists. 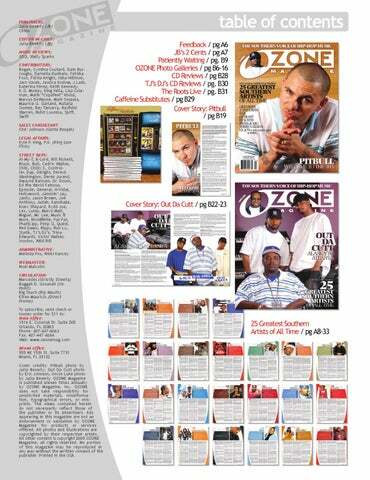 All other content is copyright 2005 OZONE Magazine, all rights reserved. No portion of this magazine may be reproduced in any way without the written consent of the publisher. Printed in the USA.